With scary costumes and tempting candy abounding, Halloween can be a frightening time for pet owners – and a risky time for pets, too. The American Animal Hospital Association encourages pet owners to protect their companion animals by being mindful of their F.E.A.R. – food, environment, attire, and recovery – to keep pets safe and happy on Halloween. Chocolate is toxic to dogs and can lead to illness and even death. Xylitol, a common sugar substitute found in gum, candy, and baked goods, is also toxic to small animals because it induces a sudden rush of insulin resulting in very low blood sugar. If your pet is one that likes to counter-surf or sneak people food, it is best not to have chocolate and xylitol candies for Halloween. Pet proof your Halloween candy by putting candy bowls in an area where your pets cannot reach them. 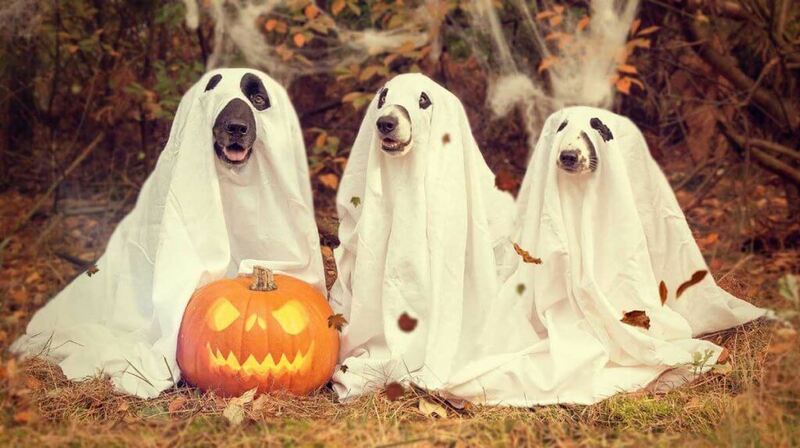 One of the easiest ways to keep your pets safe on Halloween is to control their environment. With an increase in visitors, scary costumes, noise, and doorbells ringing, even the perfect pet might feel a little tense on Halloween. Excitement and confusion can lead to unwanted behavior. Be sure Halloween decorations are safe from curious pets. Animals can easily tip over a pumpkin with a lit candle inside. Paper streamers, fake cobwebs, plastic spiders, and glow sticks are easy to chew and swallow, leading to scary complications. Keep these out of animals’ reach and maintain supervision if they play nearby. If wearing a costume turns Buster into Cujo, switch to a festive bandana or forego the costume altogether. If your little fur-rankensteins don’t mind getting dressed up, make sure their costumes don’t limit their movement, sight, or ability to breathe and vocalize. Check the costumes carefully for chewable pieces that could present choking hazards and remove them if necessary. As always, your pets should be outfitted with reflective collars and microchips in case they do escape. Have a plan in case your pet gets sick, injured, or lost on Halloween – or any other day. Not all veterinarians are available 24 hours a day, but Purdue’s Animal Emergency Service does take emergencies 24 hours a day, 365 days a year. If you have an emergency with your companion animal this Halloween, contact the Purdue Animal Emergency Service at 765-494-1107.